Big time college/university sports, with an emphasis on the BIG, is largely unique to the United States. After the Super Bowl, the most watched television show in the USA so far this year was the College Football National Championship Game, won by The Ohio State University. College sports’ impacts are also BIG: At its well-known best, it provides the student-athletes with positive, life-changing experiences and the community with a powerful way to bond. Not so well known but just as positive is the leadership role college athletics plays at the intersection of Green + Sports. This is not surprising, given 1) college campuses are hotbeds of sustainability research and innovation and, 2) the ready supply of students who are passionate about solving the climate crisis. At the head of the pack in the college sports greening movement is none other than the aforementioned Ohio State. GreenSportsBlog has chronicled how the Columbus, OH school has made venerable Ohio Stadium (aka The Horseshoe) a Zero Waste facility. Ohio State is now setting its sights on influencing fan behavior beyond the stadium by greening the tailgate area and the basketball arena. Ohio State is one of the gold standard programs in college football, with a national championship this January and a 23-game winning streak that came to an end Saturday vs. Michigan State. While Ohio’s pro loyalties are largely split between Cleveland in the north and Cincinnati in the south, it is Ohio State, in the centrally located capital city of Columbus, that is the closest thing to a unifying force in sports in the state. And with more than 106,000 fans filling The Horseshoe every home game, with 500,000+ living alumni and with millions following the Buckeyes on TV, radio and online, the impact of Ohio State football is massive. Out of 175 people surveyed in 2014*, all but 3 thought that Ohio State Athletics has some level of responsibility (slight, some, and strong) to add environmental efforts into their athletics operations. Ohio State’s Columbus campus currently gets 21% of its electricity from wind. Not bad but there is room for growth—hopefully the university will become part of the nascent 100% Sport (#Go100Percent) movement, in which sports teams commit to getting all of their electricity needs from renewable sources. Now it is important to note we’re not talking Seattle, Portland or Boulder here, but we might as well be. That the greening of Big State U sports is not only accepted, but is expected in Columbus, OH is a BIG DEAL! And The Greening of the Buckeyes is getting noticed beyond the Columbus area. 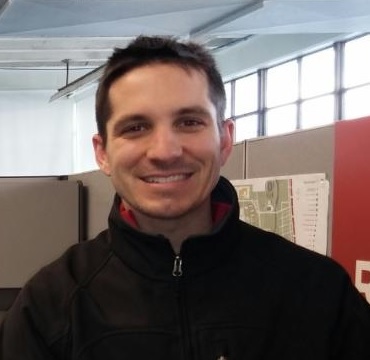 According to Tony Gillund, Ohio State’s Sustainability Coordinator, “Other universities, including athletics departments, have called to ask how we’re doing it, from the logistics to the fan engagement to the science.” On this last point, researchers at the Ohio Agricultural Research and Development Center an arm of Ohio State in Wooster, OH, worked with quasar energy group, a Cleveland-based company whose mission is to produce affordable renewable energy from commercial and municipal organic biomass, and the NFL’s Cleveland Browns, to turn food waste from Browns home games into biogas and nutrient-rich fertilizer. Composting, which made up 46.7% of in-stadium waste last season, is not yet available in the tailgate areas, but there are plans to introduce it in the next couple of years. Ohio State is also working to green Value City Arena (aka the Jerome Schottenstein Center), the 18,900 seat home of Ohio State men’s and women’s basketball, Ohio State men’s ice hockey, concerts and other entertainment events. Value City is much busier than The Horseshoe–it hosts well over 100 events per year while Ohio Stadium only hosts a fraction of that–which makes achieving Zero Waste status at the arena a more complex task, one that Ohio State is taking on gradually. 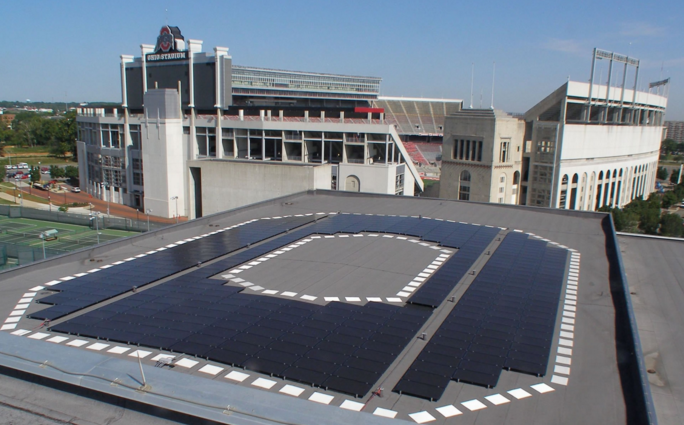 Ohio State has set an audacious, university-wide green goal for itself: Attain carbon neutrality by 2050. Getting there will take the blocking and tackling (sorry for the football pun) one might expect: A cleaner and more efficient energy mix, improved energy efficiency of its buildings, significant waste reductions, cleaner travel and commuting options and buy-in from all stakeholders. That the Buckeyes are already leading the green way makes me think Ohio State will reach its goal ahead of schedule. * Surveys were conducted among 175 fans in the tailgate areas.